Rejoice Apple fanboys in India, the Cupertino giant, has started to take pre-order of their latest iPhone 7 and iPhone 7 Plus in the country. According to the new report, it is believed that the iWorld stores in the country, which is Northern India’s premium resellers for Apple product has started to accept the pre-order for Apple’s new iPhones. Earlier this month on 7th, the company launched their latest iPhone models with an announcement for availability in 28 countries in the first phase. While the price for iPhone 7 was official out on the International launch day itself at Rs 60,000. The availability of pre-orders wasn’t revealed. The new iPhones are going to be officially made available in the country stores on October 7th. Now you can book the devices on the company’s official website, which will allow you consumers to reserve their buy at the store. Once it’s launched, they would probably have to pick up the device from the nearest Apple authorised store. Referring to the pricing of these new phones, the new iPhones would go upto Rs 92,000 for the 256GB model for the iPhone 7 Plus. Look below at the table to know more about the detailed pricing of these new devices. At the global launch itself it was announced that the new iPhones would be available later in 30 different countries followed by more countries in the coming weeks and India is in the second. 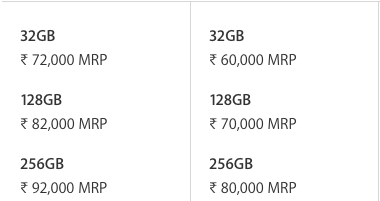 A clear difference of Rs 10,000 can be noted for every memory upgrade of these new devices which clearly distinct each of the models Apple has launched in India. Unicorn is another Apple’s premium partner in the country, which has also started to accept pre-order for the two new iPhones. The consumers who are interested in buying the new iPhones starting 7th October can pre-book the device by an advance payment of Rs 5,000. The Delhi-based premium reseller has a presence across nation wide in several states. People who are familiar with Apple products in the country would know that two of the bigger offline retailers, Tata’s Croma and Reliance Digital stores are one of the biggest Apple products sellers. It is noted that these two retailers are yet to start accepting the pre-booking at their respective stores. Duly note that Jumbo, a Dubai-based electronics stores have good presence in the country. They said to start accepting iPhone 7 & iPhone 7 Plus pre-cooking from next week. While Apple India hasn’t issued any press release regarding the pre-booking of new iPhones in the country. Do make a note that the second phase of Apple iPhones roll out would be started in 25 new countries starting from September 23rd. India seems to be in the last phase, which ever it maybe, third or fourth.